to get out on the water to glide past icebergs and capture some great photographs. Climbers and mountaineers around the world know Tasermiut Fjord, one of the world’s most prolific big-wall playgrounds. This part of Greenland is particularly dramatic, being nicknamed the Arctic Patagonia. A bit of a history lesson will be provided here as you learn about the settlements of the area, founded by Erik the Red. 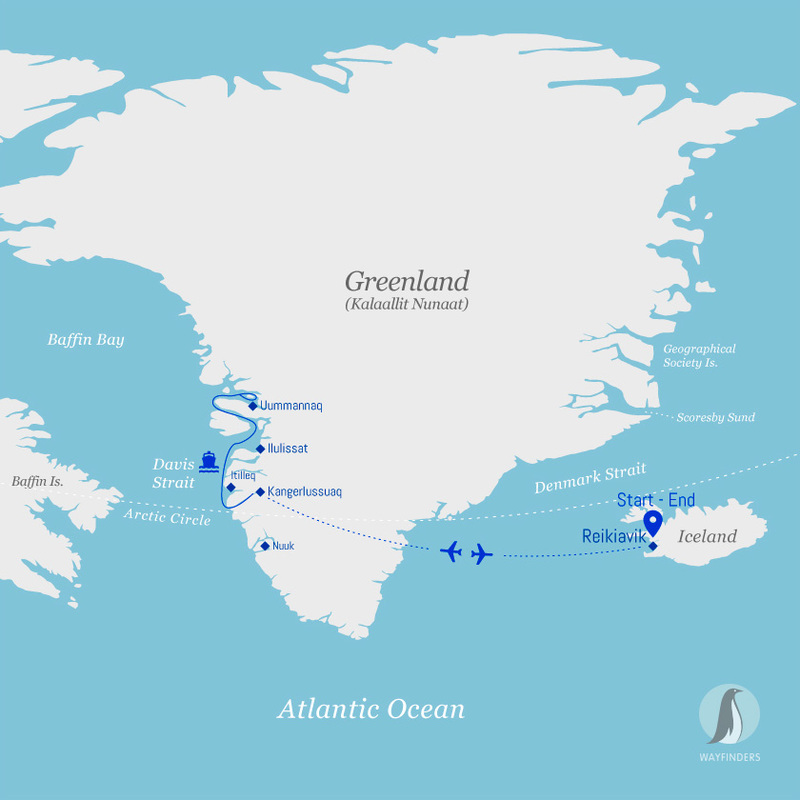 As we round Cape Farewell, the southernmost point of Greenland, we will call in at the natural hot springs found in the Uunartoq area, soak in the geothermal waters and watch the icebergs pass by. Heading north, you’ll stop at some of the quaint villages that dot the islands and fjords of Greenland’s western side. You’ll find friendly faces, local artisans and colorful houses on the wildflower- covered tundra. 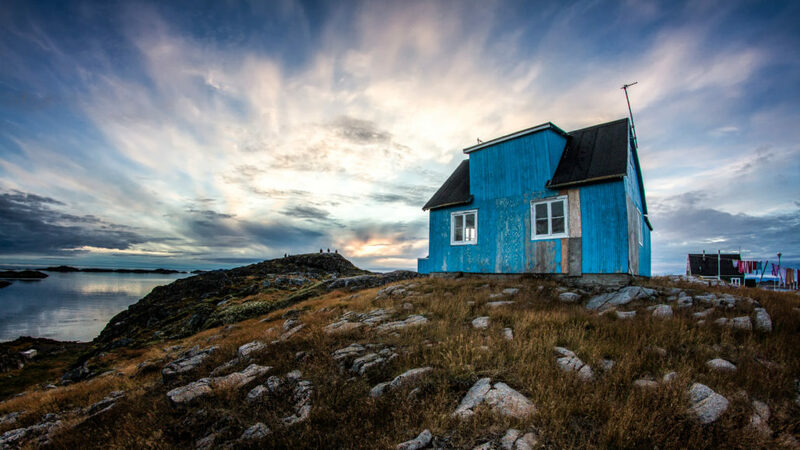 You’ll visit Nuuk, the capital of Greenland and home to fewer than 16,000 people. You’ll have time to wander the streets and see the Hans Egede Church and Hans Egede statue near the waterfront, both named after the missionary who founded the settlement. You’ll also visit the museum to see the famous Greenlandic mummies. The nearby town of Sisimiut is an interesting place to visit, as there are more dogsleds here than humans. Evighedsfjorden, which means “Fjord of Eternity,” is a favored place for us to put the Zodiacs in the water for some more in-depth exploration. This long, deep fjord has very few settlements, so you’ll come to appreciate nature in its rawest form. There will be an opportunity for hiking among the towering mountains, and you’ll have plenty of chances to photograph the colorful tundra and dramatic landscapes. the sea. You will explore the Ilulissat Icefjord, home to one of the world’s fastest-moving glaciers. Moving approximately 62 feet (19 meters) per day, the glacier provides you with a great opportunity to photograph ice crashing into the sea. Continuing along, the Amerloq Fjord offers a chance for you to stretch your legs by exploring abandoned villages and ancient Thule sites.